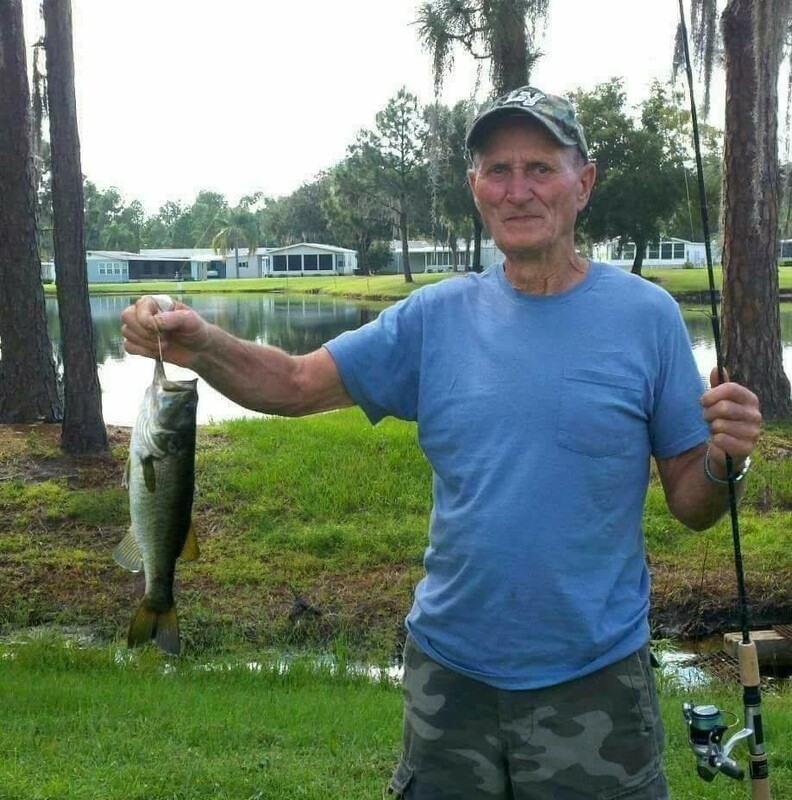 Everett “Leo” Lamson, 81, of Wesley Chapel, Florida, and formerly from the Waterbury, Vermont, area, left for happier hunting grounds on Friday, July 14, 2017, surrounded by his family which included his wife, all his children, and many of his grandchildren and great-grandchildren. Leo was loved by most, feared by a few, but respected by all. He spent his life tinkering, gardening, hunting, fishing, and entertaining small children. If you ask people what they remember most about him, they will say he was the one who taught them to hunt, fish or garden. He enjoyed assigning various chores to unsuspecting students, which sometimes included feeding his attack rooster – you can imagine how that turned out. The more he liked you, the worse he picked on you. Once, a 30-year old man met up with Leo and recalled a story he had told him when he was a boy. Leo had said that he was driving along and hit something. As he looked in his rear view mirror, he spotted a crushed basket and some colored eggs rolling across the road. The boy was certain he had run over the Easter Bunny and remembered this story his whole life. Leo concocted different versions according to the season...he seemed to accidentally “shoot” Rudolph every Christmas. His own children remember his daily wake-up ritual which included banging pot lids and singing “Oh What a Beautiful Morning” at the top of his lungs. He displayed his affection by performing “spit tortures” and lots of toe pinching. However, they also remember camping trips and long Sunday drives, stopping for creemees along the way. He could be counted on to help with science projects and building amazing play houses in the back yard. Who else had their own Gilligan’s Island tiki hut? Life was never dull in the Lamson house! He was a farmer at heart and kept many animals over the years, including goats, ducks, chickens, snakes, pigs, and monkeys. It was not unusual to come home and find an escaped animal running loose. On one occasion his wife found goats in her bed. However, as much as he loved animals, he was never partial to barking dogs. Leo was born in Burlington, Vermont, on February 12, 1936, to Clarence and Dorothy Lamson, and grew up with his 12 (yes, 12) siblings on the family farm in Richmond. He enlisted in the Army and was stationed at Fort Dix, New Jersey, where he met his future wife of 59 years, Ruthann Meseck, his buddy's cousin, while on weekend pass, who he married in 1958. Leo was a member of the Army ski team and boxing team, winning medals and trying out for the Olympics in Japan. After his discharge, he and Ruthann settled in Vermont. According to a family friend, he set the standard for rugged Vermont woodsmen, spending countless hours roaming the mountains of his home state. He enjoyed visiting the casinos and always wanted to travel out west. A few years ago he and his wife drove cross country from Florida, to Vermont, then to California and up to Washington State, fulfilling that dream. However, some of us suspect it was just an excuse to gamble in Reno. During his life he worked as a meat cutter at Lowell’s IGA in Waterbury, stone cutter at the Barre granite quarries, ran his own business specializing in metal studs, and was a machinist at General Electric in Burlington. He became a certified airplane mechanic in New Jersey and worked at Fairchild-Hiller. After retiring from GE, he went back to school and became a nurse, finishing his work career at the Vermont State Hospital. After retiring to Wesley Chapel, Florida, he became the neighborhood handyman, to the delight of many in Terrace Park Estates. Leo left behind the love of his life, Ruthann Lamson of Wesley Chapel, Florida; daughters Ginny Colbert, Debbie McCracken, Julie McKinnon, and Tammy Cota; and his son, Chris Lamson. And we all know which one is his favorite child. He also leaves son-in-laws Sal Colbert (the only person he could never teach to hunt) and Tim McCracken; daughter-in-law Heather Lamson; grandchildren Jason Colbert, Nikki Chicoine, Amanda Albaugh, Jessica DeLeon, Jared Roberts, Josie McKinnon, Jake McKinnon, Cody Lamson, Dylan Lamson; eight great-grandchildren and "second son" Scott Lamson of Waterbury Center, Vermont. He also leaves behind brothers Albert Lamson, Richard Lamson and Jack (Bozo) Lamson; sisters Sandra Williams and Marcia Holden. He was predeceased by his parents Clarence and Dorothy Lamson, and brothers Pete Lamson, Stanley Lamson, Harry Lamson, Donald Lamson; and sisters Alma Ashley, Florence Hanlon, and Rachel Guyette. He also leaves behind his beloved recliner and 1999 flip phone. A private family memorial was held in Wesley Chapel, Florida, on July 18. At a date yet to be determined, Leo will take one last road trip to Vermont where his ashes will be scattered over his favorite hunting and fishing spots.